Although there are more than 80 species of magnolias native to areas of the eastern United States and southeastern Asia, magnolia trees typically are considered the quintessential tree of stately Southern landscapes. 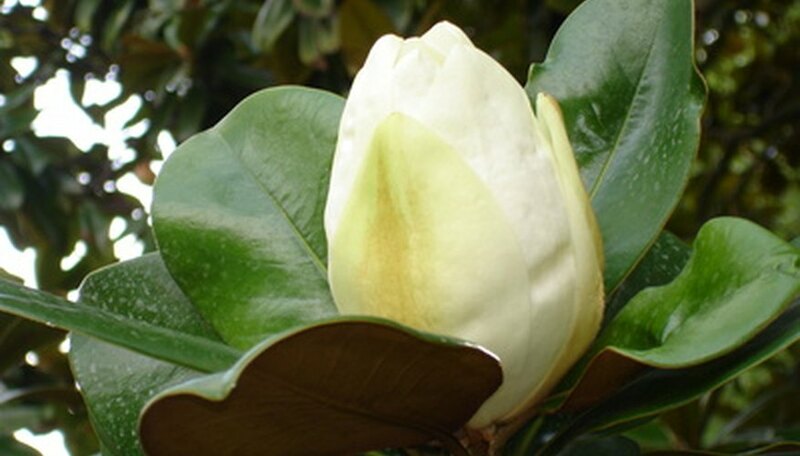 Many magnolia trees, including the “grandiflora,” or Southern Magnolia, are simple-to-grow, virtually pest-free evergreen varieties with large shiny broadleaves and showy fragrant flowers that make them low-maintenance additions to any yard. Magnolia trees, however, can be difficult to transplant once established, but with some planning and care smaller trees can be successfully moved. Measure the trunk size of the magnolia tree you want to transplant to ensure that it is no wider than 4 inches. Moving older, more established magnolias with larger trunks greatly decreases their chances of survival. Cut a large circle into the soil and through the roots around the magnolia tree with a long-handled garden spade. Dig out the tree carefully, leaving as much as the root ball intact as possible. Place the root ball of the magnolia on a tarp. Wrap the tarp around the root ball. Place the tree in a wheelbarrow or other type of garden wagon and move to the new planting location. Dig a hole twice as large as the root ball of the magnolia tree. Unwrap the tree and place it upright in the hole. Backfill the hole with a mixture of top soil and organic compost until it reaches the tree’s original planting depth. Pat the soil and compost mixture down well. Apply 10 to 15 gallons of water to the ground around the tree with a slow-running garden hose or large bucket until the ground is saturated. Replace any soil that dislodges during watering. Add a 2- to 3-inch layer of organic mulch to keep the moisture in the soil during the warm growing season and protect the tree from cold temperatures. Sever some of the roots up to one year before transplanting a magnolia tree. Cutting some roots near the root ball will help those roots branch out and sustain the tree after transplantation. Because the roots of a magnolia tree are shallow, rope-like, and extend further out than the of the branch lines of most trees, the circle you dig before removing the tree needs to be large as possible, but not so large that you can't handle the root ball during transplantation. Newly transplanted magnolias require frequent watering the first year, so water the tree whenever the soil feels dry more than 2 inches below the surface. Gilman, Edward F. University of Florida IFAS Extension: What are Tree Roots?